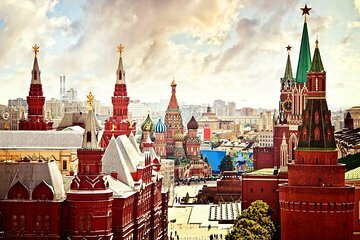 See Moscow highlights on a 4-hour private tour of the city’s historic landmarks, famous squares, and colorful streets. Enjoy the personal experience of a private guide as you explore on foot and by car, from the fountains of Manezh Square to Resurrection Gate, the Moscow Kremlin, and a 17th-century convent in the heart of the city. With a flexible departure time, this 4-hour private Moscow tour includes pickup and drop-off at centrally-located Moscow accommodations, and it’s a great orientation to Russia’s capital city. Meet a driver at your Moscow hotel at a time that’s convenient for you, then travel into the city center in a private vehicle. The first stop of the day is Manezh Square, a gorgeous outdoor space with fountains and monuments. Join a crowd of locals for a stroll around park before stopping at Resurrection Gate to see the Kilometer Zero plaque (and learn about the local legend surrounding it). Keep exploring in the Moscow Kremlin and Red Square, a UNESCO World Heritage Site, where you’ll see the colorful façade of St. Basil’s Cathedral, the GUM Department Store, and the State Historical Museum. Stroll down Moskvoretskaya Street, then meet back up with the driver for the trip to Novodevichy (New Maiden) Convent and Cemetery, with time to explore a complex of churches with remarkable icons and artwork. Drive to the top of Sparrow Hills for panoramic views over the city, then walk through Vicotory Park on Poklonnaya Hill. See the Moscow International Business Center, among the tallest buildings in Europe, and take a walk through Old Arbat, an art market with musicians, portraitists, and poets. Following your walk through Old Arbat and the nearby ring road, join the driver for the return trip to your hotel, where this tour concludes.